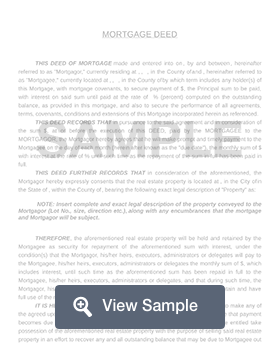 A mortgage deed is a legal document that shows the transfer of real estate. In the case of a mortgage deed, it shows that the person who owns the home transfers the ownership to the lender as security for a loan, or mortgage. Information about both parties is needed for the mortgage deed. There will also be information about the property on the deed. Some examples are the names of the homeowners, the name of the lender, mortgage amounts and payments, and legal description and location of the property. Because the mortgage deed deals with major lenders and large amount of money, it is important to get legal advice about filling in the document. Both parties should sign and a witness may be required as well. In the United State, a mortgage deed is commonly called a mortgage. In the U.K. and Canada, the term mortgage deed is more commonly used. 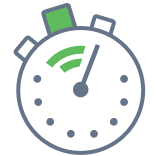 Create a free Mortgage Deed in minutes with our professional document builder. Mortgages and deeds of trust are both promissory notes, which means they are a promise to repay the amount owed. A mortgage deed is a document that you give to the lender that creates a lien on the property. There are two parties to a mortgage: the borrower/mortgagor and the lender/mortgagee. A mortgagee has the right to sell a mortgaged property if the mortgagor does not make timely payments or breaches the contract in another way. Typically the lender will have to go through a judicial foreclosure process to sell the property. A deed of trust also pledges real property to secure a loan. A deed of trust involves three parties: a trustor (borrower), a lender (beneficiary), and trustee (independent third party). A trustee will hold the title to the property and will sell the property at auction if the trustor defaults on payments. Typically, a lender who has a deed of trust can foreclose on a property without going through a non-judicial foreclosure process. When you get a mortgage to buy a home, you promise to repay that loan plus interest. You pledge your house as security for this loan. If you fail to make your monthly payments, the mortgage lender is entitled to start the foreclosure process and can sell your home to repay the mortgage debt. Mortgages can be set up in different ways. Some mortgages have fixed interest rates, while others have a variable rate. If you have a fixed-rate mortgage, you will pay the same interest rate every single year. If you have a variable rate mortgage, your interest rate will be based on the current market interest rates. When should you use a mortgage deed? You should use a mortgage deed if you are loaning money to another person or business and want to have a security interest in their property until you are repaid. You should use a mortgage deed if you would like to borrow money and want to offer your property as security until the debt is paid in full. If you need a mortgage deed and have questions about how it works, you may want to consult with a law firm that specializes in this practice area.